Hello and welcome to another edition of Before the Whistle! 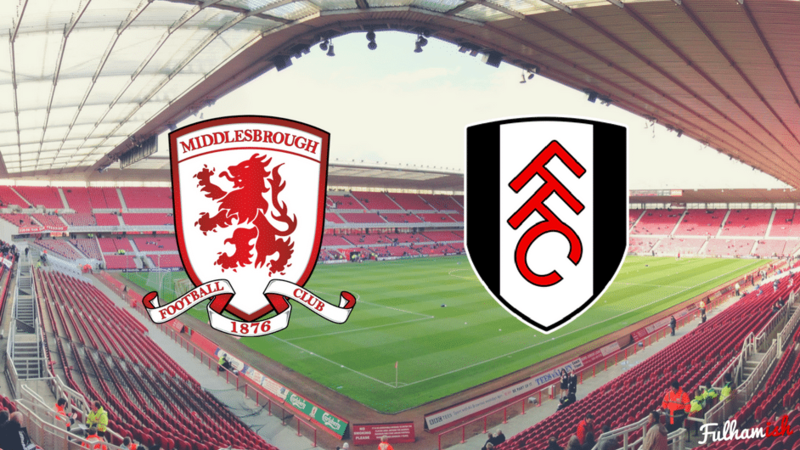 Today I take a look into our next opponents Middlesbrough, and see what we can expect when we take the journey up North to the Riverside Stadium. When we played the Boro earlier in the season, it was a closely fought game. A late goal from Abou Kamara, his first of the season, looked like it had sealed the win for the Whites. However, his celebrations were short lived, as a late goal from Cyrus Christie settled the points between the sides. This kept Fulham pegged down the table, and continued a disappointing start to the season. After being one of the favourites for automatic promotion this year, and splashing the cash over the summer, Middlesbrough have failed to live up to expectation and currently lie in 8th place in the table. Despite playing some attractive and entertaining football in the process, this wasn’t deemed good enough for the Boro owners. Garry Monk paid for this with the second harsh sacking of his career, and in his place came Tony Pulis. Whilst swapping Monk for Pulis may seem like swapping chalk for cheese, there’s perhaps more sense to the move than you’d expect. Some of the traits which Tony loves exist within the team, which he will no doubt make full use of. For instance, Boro own some physical strikers which thrive on direct balls forward, and a one of the stronger defences in the league. So whilst Pulis is still weaving his own unique form of magic, and adapting the team to his way of playing, what do Fulham need to look out for? When we played Boro at home in September, my man to watch was Assombalonga. And 4 months later, this is still the case. Looking at the top strikers in the Championship, Britt has earned his place to be classed as one of the best marksmen in the league. He’s also the clear lead striker in Boro’s team – the closest player to him in red being Martin Braithwaite, who’s output is about half that of Britt’s. In particular, he uses his power and pace to great effect to stretch opposition defences, something that Pulis will surely look to make the most of. He also has some lovely subtlety to his game. He’s great at moving into pockets of space, and finishing with either feet or with his head. So whether it’s heading in crosses from the quality ball-players on Boro’s wings, or pulling defences apart from through balls from his central midfield, his physicality and footballing brain help him create plenty of chances to tuck away. Since taking over, Pulis has rotated his squad around in an attempt to understand his best 11 – playing 3 different formations in 3 games. However, the attacking focal point in each game has continued to be Assombalonga. Depending on who he’s partnered with, Britt has adapted his game. Whether he’s stretching defences as a lead striker, or operating in the space behind a targetman, he’s able to find shooting positions with ease. I wouldn’t be surprised if Pulis plays Britt slightly behind Rudy Gestede. The 6ft4 striker is a magnet for long and high balls, something Pulis is clearly not against using. If this is the case, expect to look out for knock-downs to Britt from long balls – a tactic Boro successfully used to knock Sunderland out of the FA cup. Irrespective of who plays upfront, Middlesbrough are going to attack with pace and width, using the physicality of their strikers to create chances. Therefore, we will need to provide a defence which can combat this. This may be the kind of match where putting Odoi in defence, maybe even at CB, may help. His pace and leap would be a useful tool to nullify the striker’s threat, and combat the pace and power of Boro’s attack.